The geological structure that develops around Mt. Dukono is in the form of faults and craters (Sumaryadi, 1998). mt. 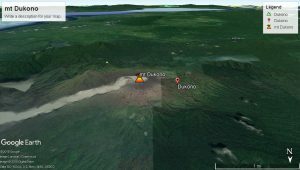 Dukono is the northernmost volcanic volcano from a series of active volcanoes that appear on the volcanic arc in the western part of Halmahera Island. Around the summit there are a number of craters and some of them have been extinguished. The craters are Tanah Lapang, Dilekene A and B, Malupang Magiwe (C), Telori (D), Heneowara (G). Malupang-Warirang Crater on the slopes of mt. Karirang is an activity center and the most active crater in the mt. Complex. Dukono at this time. the geological structure that develops around Mt. Dukono is in the form of faults and craters (Sumaryadi, 1998). Fault structure identified as normal fault, namely Dukono Normal Fault and Kua Normal Fault. The Dukono Normal Fault is a horseshoe-shaped depression zone open to the northeast, having a diameter of 12 mm. 7000 m and inside there are several volcanic cones including mt. Dukono. Kua Normal Fault is formed on the western slope of mt. Kua which forms a fault line is northwest – southeast. The crater structure identified at least 9 crater structures, namely mt crater. Gosana, crater mt. Mamuya, Crater mt. Mede, Field Land Crater on mt. Gogodom, crater mt. Telori, Mt Kawah. Dilekene, Mt Crater. Mancile, Kawah mt. Kariang and Kawah Malupang Warirang in mt. Kariang (the active crater of Mt Dukono at this time).